There are so many bug sprays and insect repellents to choose from! Sometimes it can be quite overwhelming to make a decision. 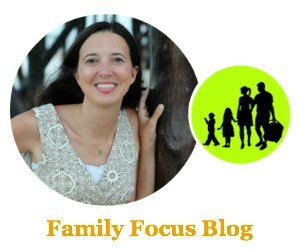 Last summer I really focused on what I was putting on my body and also more importantly my children’s bodies…from lotions to body wash to sunscreen and even bug spray. There are far many more toxic ingredients in products on the market than all natural safe ones. So I did some research and made my own products including this Natural Insect Repellent Recipe. I find that works great as a general bug and mosquito repellent. It is safe for kids and contains only 4 ingredients! 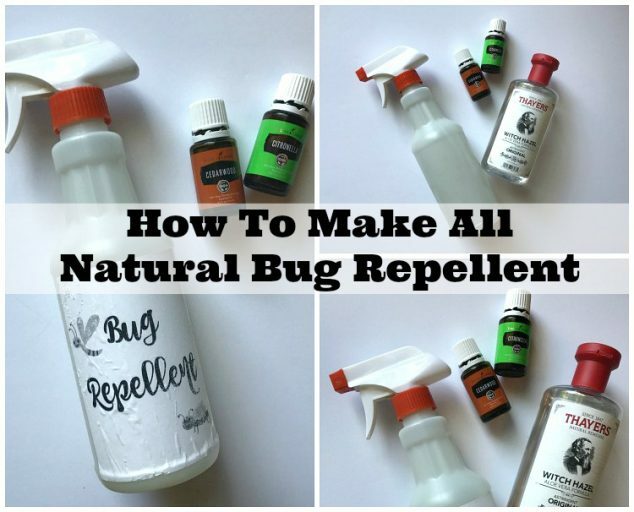 You are going to love how easy it is to make natural insect repellent that works. Gather all of your supplies and head to the kitchen counter. Grab a measuring cup and pour 4 oz of distilled water into your spray bottle. 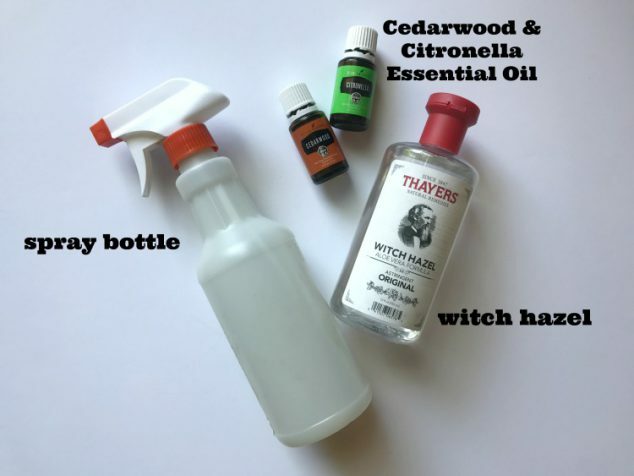 Follow by measuring out 4 oz of witch hazel and pour that into your spray bottle as well. Next, add 25 drops of your Young Living Cedarwood essential oil and then 25 drops of your Young Living Citronella essential oil. Certain essential oils have certain properties and naturally occurring chemical constituents that repel certain insects. Cedarwood essential oil is effective on mosquitoes, ticks and many other insects. Citronella essential oil repels mosquitoes by blocking the scent that attracts these bugs, causing them to become disoriented. After you have added all of your ingredients into your spray bottle, screw the top back on, give a gentle shake and you are ready to spray! 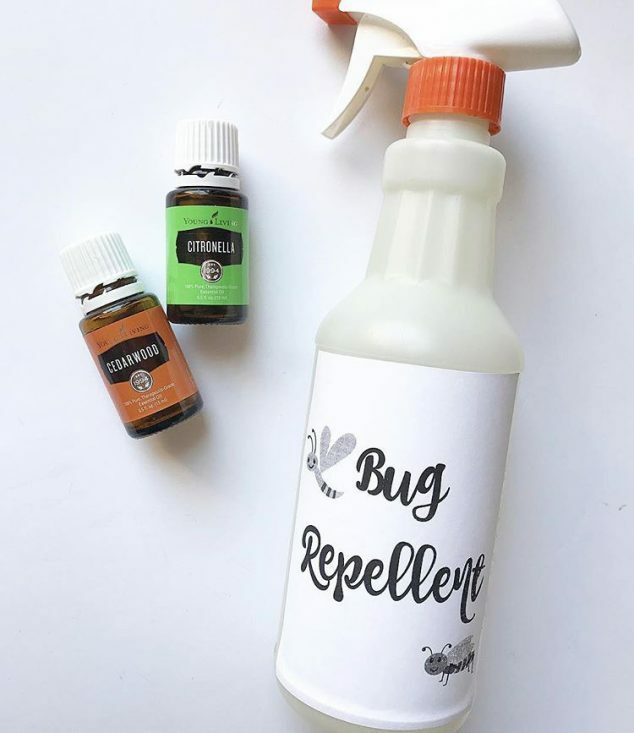 It is that simple to make natural insect repellent that you can use to help ward off mosquitoes and other creepy crawlies! Make natural insect repellent and be sure to spray liberally on skin and cover every exposed area. If you need to apply on face, spray a small amount on hands then apply to face making sure to avoid eyes. To avoid insect bites, reapply every hour or so depending on how bad the bugs are around you. Do you think you will try this natural insect repellent recipe? Love this DIY solution. Kids had fun testing out their solution and avoided the bug spray fight. So where is the research that this works? DIY and “all natural” are fine for some things… but in my world mosquitos now routinely transmit life-threatening diseases, for some of which there is no cure. There is no way I am going to stake my life or future health on some unsubstantiated bright idea. Both at home in Canada, and when I travel abroad, I use and carry commercial preparations with the highest percentage of DEET I can find. Yes, it feels oily and smells gross; yes, it is damaging to plastic and many other materials, and no I don’t put it directly on children’s skin (only on their hair and clothing). I also use mechanical barriers like mosquito netting (if there are no screens) and impregnated fabrics. I hear even medical people talk about their natural remedies and vitamins. But I also notice that when we go out to a bush bar in the evening in Central America, everyone wants to use my DEET.